Measurement categories are determined by the potential for dangerous transient impulses on the mains supply system, the magnitude of which depends on the amount of damping of the transient energy due to the location within the system and the system voltage. Short-circuit current levels are also a factor. Test equipment used for measuring mains circuits will be marked with one or more of three measurement categories, CAT II, CAT III or CAT IV, to identify on which installations of a mains supply system it can be safely used. Each category has a voltage rating marked to indicate the maximum safe phase to earth system voltage (conventionally 50V, 100V, 150V, 300V, 600V or 1000V). 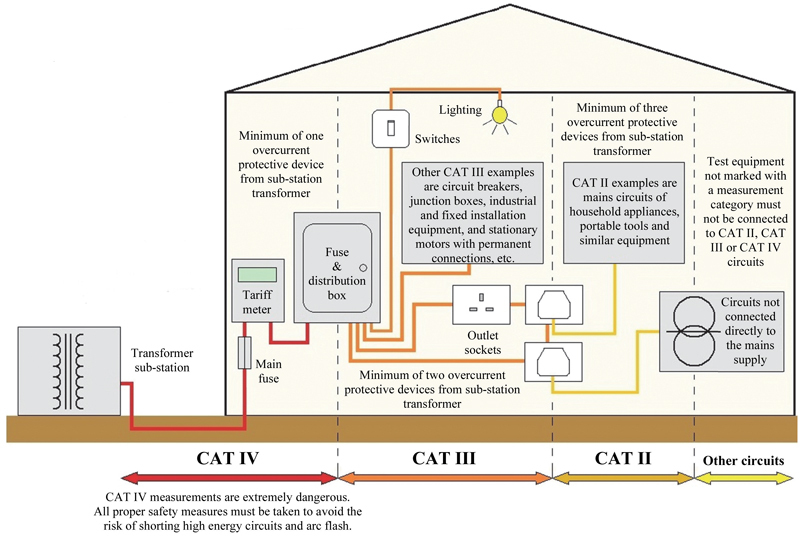 Transient impulses are greatest for CAT IV 1000V installations. 'CAT IV 300V, CAT III 600V' is an example of measurement category marking on a unit. The unit can only safely be used on CAT IV installations where the phase to earth voltage is <300V and on CAT III installations <600V. Such a unit could safely be connected between phases on CAT IV installations of a 3-phase distribution system where the phase to phase voltage is 400V because the phase to earth voltage is 230V.